A result of a cross between pear varieties Beurré Superfin x Williams' Bon Chrétien, first introduced in 1938. Beth (Pyrus 'Beth') is an excellent garden pear variety. The pears are initially green, turning to pale yellow with a smooth skin. The pears themselves are delicious, being small, sweet with juicy flesh. 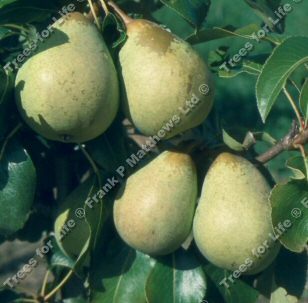 Self-fertile/Not self-fertile: This pear is not self-fertile so it is necessary to have another pear for pollination nearby. The code we have given this pear tree means that you need to find another pear with the same code or one less or one more, so for example, if the pear is code C3, then another pear variety with code C2 or C4 would be suitable to act as a reliable pollination partner.